This image from a GoFundMe page shows the partially collapsed wall of the house on Harding Boulevard in Birch Cliff. 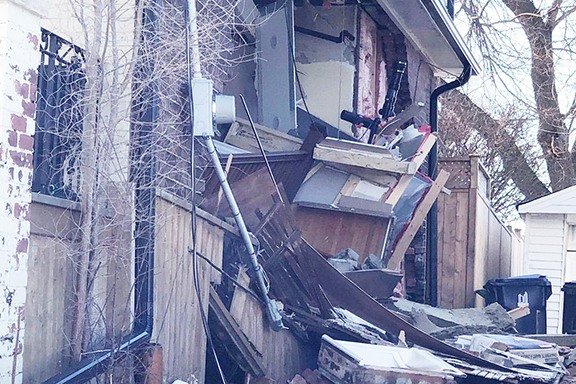 A Birch Cliff family of four is in need of help after their four-bedroom home partially collapsed earlier this year. To help them, A GoFundMe page has been set up to help collect donations for the family who were left devastated, shocked and homeless after the partial collapse of their Harding Boulevard home on Saturday, Feb. 23. Family, friends, and community members have been showing great support for the family since the incident, which has gone from bad to worse as the City of Toronto has condemned the house as unsafe. The family has not been allowed back into their property for any personal belongings since it was ruled unsafe. This has been especially hard on the family since they had lived in the home since 2003. Shea Warrington, a local real estate agent with Royal LePage Estate Realty, is now representing the family as they have put the home up for sale, with a price listed at $499,999. “Since the city has ordered the home to come down, we are hoping a buyer will either renovate or buy the property,” Warrington said. During this tumultuous time the family have been staying with other family members. The GoFundMe campaign was started on April 5 and has a goal of $100,000. As of noon on April 12, $25,190.00 had been raised. “If you are able to donate anything you may be able to give, that would be immensely helpful and extremely appreciated. This sort of ask is well outside their comfort zone, and we want to be as sensitive as we can, but all we want is for them to be as comfortable as possible,” said the description of the campaign on the GoFundMe page.